There were two authors who dominated the Neo-Classical sculpture: the Italian Antonio Canova and the Danish Bertel Thorvaldsen. Canova dominated with his artistic personality the European art of his time. He renewed the classical art in Italy. He was formed in Venice and developed his mastery in Rome. Nobody as him was able of working the marble. 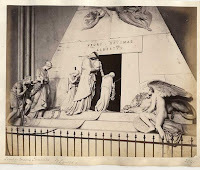 He was the sculptor of enormous tombs, such as that of Napoleon, following the Antique tradition. He also was the artist depicting heroic Roman gods and light nymphs. One of his most famous works is that of Cupid and Psyche, group in which love awakes a sleeping Psyche who was under the effect of a magic perfume. This work is an anthem to love at the same time that a reminder of Psyche legend, that refers to the immortal soul of the platonic myth. Without scarifying the rules of the Academy, Canova built a pyramid of mixed bodies, animated by a play of members that move with the light. The transparency of white marble adds poetry to a largely meditated group. Thorvaldsen was the Nordic sculptor closest to Canova. After his formation at Copenhagen he moved to Rome. He stressed the severe component of a kind of primitive sculpture, which is full of a neo-Greek solemnity facing the Hellenistic interpretation made by Canova. The models of the 5th century come to life again in works such as Jason, Ganimede or the Alexandre’s Freeze. His images are frequently naked, showing internal peace and with a confident gesture.